I'm back with a really CAS masculine 70th birthday card. I was invited by Lyndal last weekend for a Crafty catch up at her place. There were 8 of us crowded around her dining room table and it was a fun day. One of the ladies brought along a book cover vinyl she had purchased from Kmart. 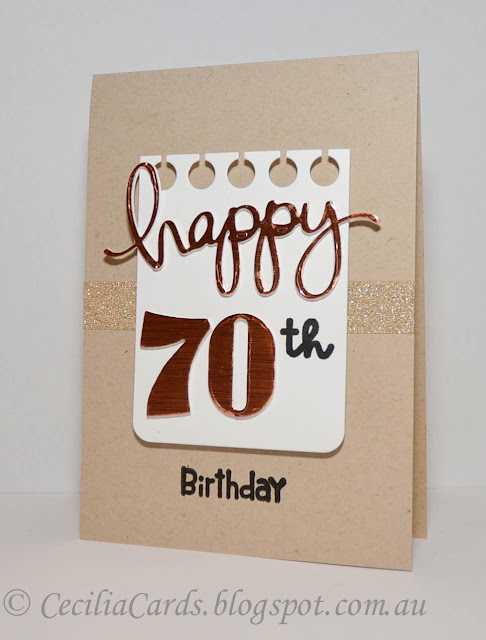 A few of us had a go with die cutting the vinyl and I brought some leftovers home to make this card! I've got to go to Kmart to get some more. They will be great for Christmas cards!! I'm adding this card to Paper Smooches Guest Designer Challenge.